I know we already did a treat for Teacher Appreciation but it only seems approprite to do another. Teachers are amazing and wonderful. They give of themselves to help our children. It is their week and I want them to feel appreciated. 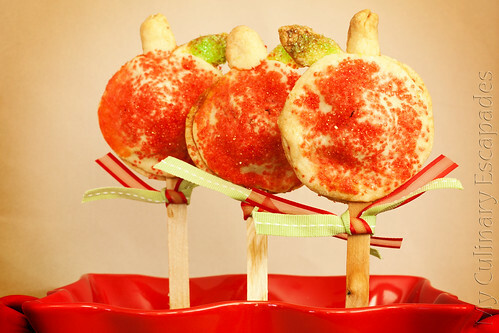 I have seen pie pops all over the internet and have always found them to be super cute. 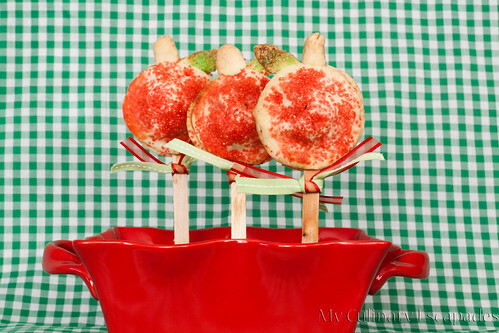 With Teacher Appreciation Week making those pops into apples was a perfect fit. I think they came out so cute. Apples and Teachers are a classic combo. They aren’t terribly hard to make just take quite a bit of patience and time, but in my opinion they are totally worth the time. So delicious and fun. I know any teacher would be happy to sink her teeth into one of these apples. The dough is one I have used before for homemade pot pies. Raspberri Cupcakes is where I got the recipe I used for the dough. Her site is beautiful and amazing. If you have time you should look around it, you won’t be disappointed; disappointed no, hungry yes! So many recipes on there to try and so many great photographs of food. The apple pie filling is one I have made before for bigger pies. It is tasty and works well with any type of apple you have one hand. Today I made this with granny smith because that was all I had around. Normally I would throw in a red delicious into the mix but my kids got to them before I could. I used my trusty Basic Apple Peeler to get the thin slices and peel off then diced that up. If you have never used one BE CAREFUL, you can injur yourself easily. Trust me, I speak from experience. Still this is the best thing for this job and my kids love it when I slice apples with this device. It makes a big slinky of apple and kids really dig that, at least mine do. You are going to need popsicle sticks for this craft. Make sure they are used ones from the last time your kids ate popsicles, teachers don’t appreciate that. Any kind of craft sticks will work. Add apples, lemon juice, butter, vanilla, brown sugar, cinnamon, and nutmeg to a saucepan on medium heat. Stir regularly and cook until most of the moisture has been evaporated. This is very important for these pies because you don’t want any oozing. Normally oozing is good but here it can be a major mess and not pretty. Once mixture has cooked for 5-10 minutes remove from heat and allow to cool for a couple minutes. Add the flour into the mixture and set it aside. You will want it to be completely cool before you try to make the pies. Combine the flour, sugar and salt in the food processor. Pulse several times to make sure they are well mixed. Add butter and pulse until small balls form in the dough. In a separate dish xombine the egg and milk. Mix well and add to mixture in food processor all at once. Pulse food processor until entire mixture comes together. Split dough in half and wrap each half in plastic wrap and chill in the fridge for at least 30 minutes. Once your dough has chilled properly take it out and on a generously floured surface begin to roll your dough out. I used my 2 1/2 inch round cutter to cup the dough. Place 8 rounds on a cookie sheet lined with parchment paper. Cut 8 leaf designs out of the extra pastry dough. I did this step by hand but if you would rather they have cookie cutters for fondant in the shape of leaves. Set these leaves on a separate sheet of parchment paper and brush with egg wash. Sprinkle green sanding sugar over your leaves and set aside. Make an egg wash using one egg and a tbsp of water. Beat well and use your pastry brush to brush the egg wash onto the rounds. 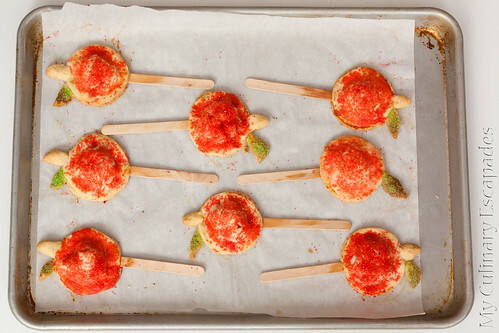 Put a popsicle stick on each round about an inch or more in. Place 1 teaspoon of apple pie mixture onto the middle of the round. Take one of your leaves and place it on the top of the apple as though it is coming out from the core. Using the spare dough roll some in your hands to create a small stem. Place this beside the green leaf. Remoisten the edges of the pies and gently place another round of plain dough on top of the pie. Press gently around the edges to seal the pie pop. Brush the top with the egg wash being careful to not get egg wash on the stem or leaf. Carefully sprinkle Red Sanding sugar over the round part of the pie. Place pies in a preheated 350 degree oven for 20 minutes. Allow to cool on the cookie sheet for 5 minutes. These pies are very delicate and the leaf and stem can break off easily. Be mindful of that when picking them up or packaging them. Best way to pic them up is by the dough itself rather than the sick.